The Directorate of Foundation Programmes runs one academic session (of two semesters) Foundation (Pre-Degree) Programme aimed at preparing candidates who could not gain admission into the University through the Unified Tertiary Matriculation Examination (UTME), but possess the minimum entry requirements for admission into 100 level in their respective courses. Applicants must possess at least, five (5) credit passes in SSCE/WASC/GCE O’ Level/NECO/NABTEB at not more than two (2) sittings in English Language, Mathematics, Literature-in-English and two (2) other subjects. 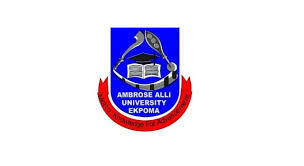 Candidates seeking admission into the Department of Physical and Health Education must possess at least, five (5) credit passes in SSCE/WASC/GCE O’ Level/NECO/NABTEB/TC II or its equivalent certificate recognized by the Senate of Ambrose Alli University at not more than two (2) sittings. The credit passes must include English Language, Mathematics, Biology or Agric. Science, Health Science, Physical and Health Education. Fine and Applied Arts: Applicants must possess at least, five (5) credit passes including English Language and Mathematics in SSCE/ WASC/GCE O’ Level /NECO /NABTEB at not more than two (2) sittings. A credit or pass in Fine and Applied Arts is an additional advantage. Candidates having TC11 with at least merit grade in Fine and Applied Arts may also apply. Applicants must possess at least, five (5) credit passes including a credit pass in English Language and Mathematics at not more than two (2) sittings in SSCE/WASC/GCE O’Level/NECO/NABTEB provided that at least three (3) of the credits are in relevant science subjects. in relevant science subjects. A credit pass in Physics may not be mandatory for Statistics option in the Department of Mathematics. Please visit the University website and portal https://aaue.waeup.org for details on purchase of form and procedure for application. Application forms for the Foundation (Pre-Degree) Programme will be available online for completion and submission from Monday, 18th September 2017 to Thursday, 30th November 2017. PROSPECTIVE CANDIDATES SHOULD NOTE THAT THEY WILL BE REQUIRED TO REGISTER AND WRITE THE 2018 UNIFIED TERTIARY MATRICULATION EXAMINATION (UTME) AND OBTAIN A MINIMUM SCORE OF 120 POINTS IN ADDITION TO PASSING THE QUALIFYING EXAMINATION AT THE END OF THE PROGRAMME FOR THEM TO PROCEED TO 100 LEVEL IN 2018/2019 ACADEMIC SESSION.